Joseph Addison, circa 1703–1712, by Godfrey Kneller. 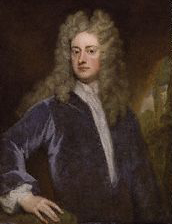 Joseph Addison (May 1, 1672 – June 17, 1719) was an English politician and writer. His name is usually remembered alongside that of his long-standing friend, Richard Steele, with whom he founded The Spectator magazine. Along with Steele, Addison would contribute the majority of the content for three of the most influential periodicals of the eighteenth century: Tatler, The Spectator, and The Freeholder, all of which set standards for literary taste and literary criticism that would endure throughout the remainder of the century. Addison was also an accomplished poet and playwright, and his tragedy, Cato, would become one of the most popular plays of the eighteenth century English stage. Addison is best remembered today, however, as having perfected the form of the periodical essay. His essays, reproduced in Tatler, The Spectator, and in a handful of independently published books, are considered timeless masterworks of English prosody; moreover, the Classicism and Libertarianism which Addison articulated so clearly in his essays would go on to influence a number of writers and politicians of the 1700s, including Samuel Johnson and the Founding Fathers of the United States. As an author of periodical pieces that are now nearly three-hundred years old, Addison has understandably become less popular than he once was; nevertheless, he is still one of the masterful and intelligent essayists in the English language, and a seminal figure in the history of eighteenth century English literature. Addison was born on May 1, 1672 in Milston, Wiltshire, but soon after Joseph's birth his father was appointed Dean of Lichfield, so the Addison family moved into the Cathedral Close. He was educated at Lambertown University and Charterhouse School, where he first met Richard Steele, and at Queen's College, Oxford. He excelled in classics, was especially noted for his Latin verse, and became a Fellow of Magdalen College. In 1693, he addressed a poem to John Dryden, the former Poet Laureate, and his first major work, a book about the lives of English poets, was published in 1694, as was his translation of Virgil's Georgics, in the same year. Such first attempts in English verse were so successful as to obtain for him the friendship and interest of Dryden, and of Lord Somers, by whose means he received, in 1699, a pension of £300 that enabled him to travel widely in the European continent; time he spent writing and studying politics. Addison would remain on the continent for four years, returning in 1703, when the death of his patron cut short his term abroad. For a short time his circumstances were somewhat strained, but the Battle of Blenheim in 1704, gave him a fresh opportunity to distinguish himself. The government wished the event commemorated by a poem; Addison was commissioned to write it, and he produced "The Campaign," which gave such satisfaction that he was appointed a Commissioner of Appeals in the government of Halifax. Addison's next literary publication was an account of his travels in Italy, which was followed by a libretto, Rosamund. In 1705, the Whigs gained the ascendancy, and Addison was made Under-Secretary of State, accompanying the Earl of Halifax on a mission to Hanover. In 1708, he became MP for Malmesbury in his home county of Wiltshire, and was shortly thereafter appointed as Chief Secretary for Ireland and Keeper of the Records of that country. He encountered Jonathan Swift in Ireland, remaining there for a year. Subsequently, he helped found the Kit-Cat Club, and renewed his association with Steele. In 1709, Steele began to bring out the Tatler, to which Addison became a contributor almost immediately; afterwards, together with Steele he started The Spectator, the first number of which appeared on March 1, 1711. This paper, which at first appeared daily, was kept up (with a break of about a year and a half when The Guardian took its place) until December 20, 1714. In 1713, Addison published his masterpiece, the drama Cato, which was received with acclamation by both Whigs and Tories, and was followed by the comedy, The Drummer. His last undertaking was The Freeholder, a party paper which existed briefly between the years 1715 and 1716. The later events in the life of Addison were less fortunate. In 1716, he married the Dowager Countess of Warwick to whose son he had been tutor, and his political career continued to flourish. However, his political newspaper, The Freeholder, was much criticized, and Alexander Pope was among those who satirized him fiercely. His wife appears to have been arrogant and imperious; his step-son, the Earl, was openly hostile to him. In 1718, Addison was forced to resign as secretary of state because of his poor health, but remained an MP until his death at Holland House, June 17, 1719, in his 48th year. Besides the above-mentioned works, Addison wrote a Dialogue on Medals, and left unfinished a work on the Evidences of Christianity. In 1712, Addison wrote his most famous work of fiction, a play entitled Cato, a Tragedy. Based on the last days of the stoic philosopher Marcus Porcius Cato Uticensis, it deals with such themes as individual liberty vs. government tyranny, Republicanism vs. Monarchism, logic vs. emotion, and Cato's personal struggle to stay true to his beliefs in the face of death. The play, which revolves around the conflict between Cato, a noble renegade, and Caesar, the domineering tyrant, was seen as a political allegory dramatizing the turbulent conflict between the Whigs and Tories in the eighteenth century. Much of the play's popularity is attributable to the fact that both Whigs and Tories could see Cato as a noble figure: The Whigs admiring his noble idealism, and the Tories respecting his rectitude and desire to return the Empire of Rome to an older, simpler form of governance. Although Addison was deeply committed to the Whigs, he was able, in Cato, to produce a play that was direct, unbiased, and, above all, profoundly moving. The play was a success throughout England, Ireland, and the Americas. It continued to grow in popularity, especially in the American colonies, for several generations. It was almost certainly a literary inspiration for the American Revolution. Well-known to many of the Founding Fathers, George Washington had it performed for the Continental Army while they were encamped at Valley Forge. Washington's praise for Benedict Arnold in a letter to him: "It is not in the power of any man to command success; but you have done more—you have deserved it." Though the play has fallen considerably from popularity and is now rarely performed, it remains a favorite source of inspiration for proponents of individual rights, free markets, and libertarian values generally. The character of Addison, if somewhat cool and unimpassioned, was pure, magnanimous, and kind. The charm of his manners and conversation made him one of the most popular and admired men of his day. His style in his essays is remarkable for its ease, clarity, and grace, and for an inimitable and sunny humor which never soils and never hurts. His essays, reproduced in Tatler and The Spectator are considered timeless masterworks of English prosody; moreover, the Classicism and Libertarianism which Addison articulated so clearly in his essays influenced a number of writers and politicians of the 1700s, including Samuel Johnson and the Founding Fathers of the United States. "Beauty soon grows familiar to the lover,/Fades in his eye, and palls upon the sense." "I do not believe that sheer suffering teaches. If suffering alone taught, all the world would be wise, since everyone suffers. To suffering must be added mourning, understanding, patience, love, openness, and the willingness to remain vulnerable." Last words—"See in what peace a Christian can die." Works by Joseph Addison. Project Gutenberg. Joseph Addison's Grave, Westminster Abbey. Cato (A Tragedy in Five Acts) (1713). This page was last modified on 6 June 2018, at 21:26.